The dynamic texture of the various voices and the uplifting spirit of the lively choir was contagious, with the enthusiastic audience humming along to almost every song in the choir’s repertoire. It was back in May 2010 that the first concert took place, after a call from the Townhouse Gallery to host the international project of the Complaints Choir in Egypt. 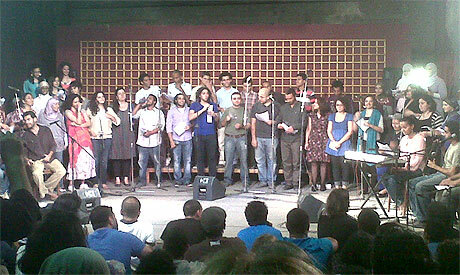 “After the success of the Cairo Complaints Choir and the experimental process of collaborative music-making, a core group of us wanted to keep the project going and decided to do so by reviving the same workshop practice with different themes,” explains Wiam El-Tamami, a 27-year old writer and one of the Choir’s founding group. Inspired by the details of the day-to-day life of the Egyptian citizen, the themes vary from one workshop to another; ads, complaints, proverbs, utopia and the relation with the “Other”. The Choir Project is a workshop open to everyone, regardless of age or background. Participants, both amateurs and professionals, work together intensively for five to six days, where they are invited to express themselves, their dreams and concerns and put them into words, leaving improvisation, the group spirit to take over. One workshop after another the choir has developed their repertoire, their audience, and their popularity. “The project is attractive to people because it’s authentic. People are singing what they want to say, there is no place for pretension, the audience understands and can easily relate to what we are singing about,” says Shady El-Husseiny, 24, a musician and a founding member. Behind the theatre curtains, he stood shaking hands with the members of his choir before going on stage to take their places, ready to release their energy with every note they sing. With a gentle yet firm touch, on the rhythm of his percussion beats, Salam Yousry, a theatre and artistic director, led the fifty singers with remarkable smoothness. With nine years experience in theatre direction and artistic production experience, Yousry has the personal and professional skills to manage the needs and bring out the best in the group. A task, according to the young director, that requires openness and patience to accept everyone’s differences and ensure a consistent artistic production. Thanks to Yousry, who moderated the first pilot workshop, the initiative has developed and the project celebrated its first anniversary at the concert at the Jesuit cultural centre. With six workshops and an average of 90 participants of different ages, social and cultural backgrounds, the choir project continues to flourish. “We need to reach members of the public that we never have before, and when this happens we beleive what we are doing is extremely important!” says el-Husseiny. The ambitious plan is aiming high with ten workshops already scheduled this year. It started with the Amman workshop, Choral el Shaab (The Choir of the People) on March 2011, and continues to include London, Alexandria, Beirut and Munich. “When our network of cities has expanded, we want to hold a huge workshop for participants all over the world, and maybe then we can produce a CD album of our songs,” Yousry says. Despite the promising future, the project still has many hurdles to overcome. Cherishing their independence and freedom, the founders strongly reject the idea of searching for funding to ensure the project’s sustainability, so organisation and finance remain their main challenges. “This is an expensive project, which I have paid for from my own pocket. The only support we get is when an organisation pays for our accommodation, but I do it because I feel this is a great project that will grow and grow,” explains Yousry. Joining this choir has been fulfilling to me in many ways. it brought me a lot of joy and happiness.. i have learnt with this choir the real meaning of being part of a successful teamwork.. when to speak and when to listen, and how to respect other people's point of view.. this group of people included individuals who are different in their looks, ideas, religions, but who were able to maintain a lot of respect, understanding and even harmony in their relation.. Salam said, this is a great project..i totally agree with this and i am willing to give wtever it takes from my effort and time hoping it remains as special and inspiring as it is.. It is truly a fabulous project with an amazing energizing spirit that effects us all !